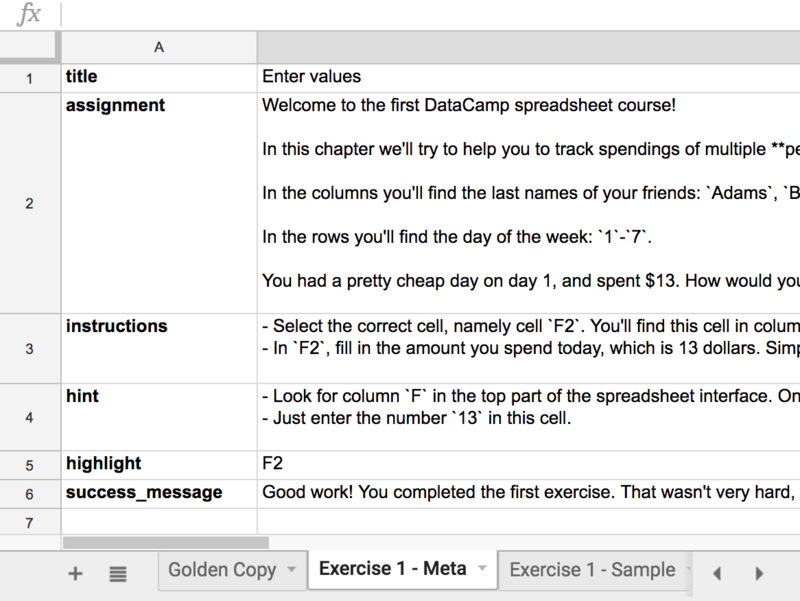 Learn about meta sheets, where you will provide various information about an exercise. The following naming convention should be used for the meta sheet: Exercise <exercise number> - Meta . success_message: success_message of the exercise. This is the message students see when an exercise is completed. type: the type of the exercise. More on this in the section about other exercises. If no type is defined, the default type will be used. data_selectors: this is a field that gives you control over which data is preserved between exercises. The value should be a list of keywords separated by a comma, e.g., values, formulas. styles: all style information in the sheet. This includes column widths, row widths, borders, and number format. It does not include merging cells or conditional formatting. Note that including styles will cause the highlight field to be ignored. This keyword is a superset of numberFormat. You can use them both, but using only styles will have the same effect. If no data_selectors are set, the default is values, formulas, numberFormat, pivotTables, charts.